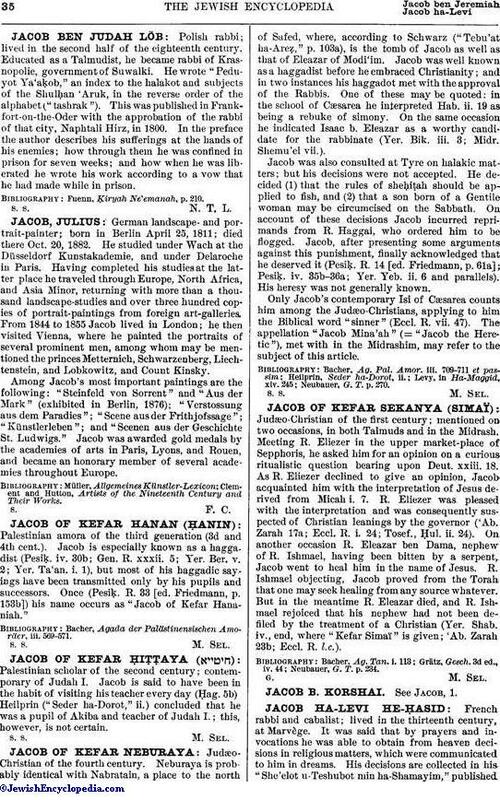 Judæo-Christian of the first century; mentioned on two occasions, in both Talmuds and in the Midrash. Meeting R. Eliezer in the upper market-place of Sepphoris, he asked him for an opinion on a curious ritualistic question bearing upon Deut. xxiii. 18. As R. Eliezer declined to give an opinion, Jacob acquainted him with the interpretation of Jesus derived from Micah i. 7. R. Eliezer was pleased with the interpretation and was consequently suspected of Christian leanings by the governor ('Ab. Zarah 17a; Eccl. R. i. 24; Tosef., Ḥul. ii. 24). On another occasion R. Eleazar ben Dama, nephew of R. Ishmael, having been bitten by a serpent, Jacob went to heal him in the name of Jesus. R. Ishmael objecting, Jacob proved from the Torah that one may seek healing from any source whatever. But in the meantime R. Eleazar died, and R. Ishmael rejoiced that his nephew had not been defiled by the treatment of a Christian (Yer. Shab. iv., end, where "Kefar Simaï" is given; 'Ab. Zarah 23b; Eccl. R. l.c.). Neubauer, G. T. p. 234.